With the risk of SIDS (Sudden Infant Death Syndrome) pediatricians are telling new moms that babies should be sleeping on their backs in a crib that is free of toys, blankets, and any other possible breathing hazards. 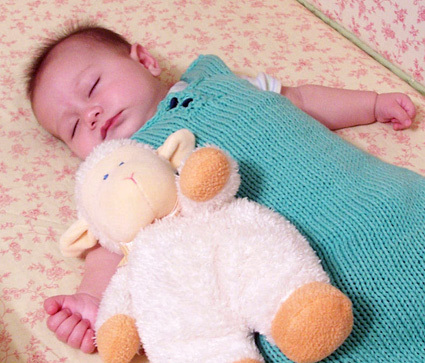 This has led to the introduction of sleep sacks for babies of all ages. During my pregnancy I searched for one for our little bundle of joy, but could only find them online in bland pastel baby colors. I knew my little lamb had to have one, as they are de rigueur among the tiny crowd, but we don't do pastels. What's a happening mom to do? Knit her darling a zodiac baby sack, of course. Since I had yet to meet my little one, I relied on her astrological sign to tell me everything I needed to know. Zodiac is close-fitting around the baby's chest with a two-button neck closure to aid in dressing. The sack is an a-line design leaving plenty of room for toe wiggling and kicking, with a convenient bottom zipper for middle of the night diaper changes. 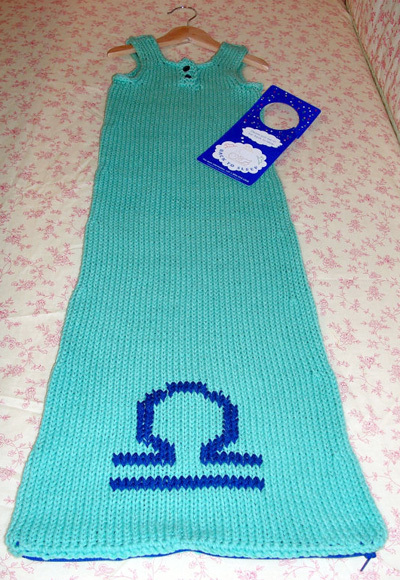 It is personalized with the baby's astrological sign and can be knit in that sign's power colors (see color information at end of pattern). Now you can make the perfect personalized baby gift months ahead of time for that bundle on the way, and baby will never kick off her covers again. Zodiac is worked in the round from the lower edge to the underarm, then the work is divided and the upper front and back are worked separately. The shoulders are attached using a three-needle bind off. It features an attached i-cord edging around the armholes and neck, a charted duplicate stitch design, a bit of single crochet around the hemline, and a zipper. 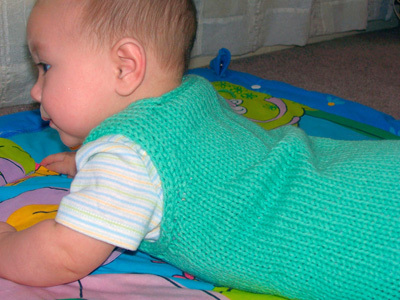 Cotton-Ease is a nice baby-safe alternative for the summer months. Any non-fuzzy (baby could ingest the loose fibers fuzzies produce) worsted or aran weight will do nicely. 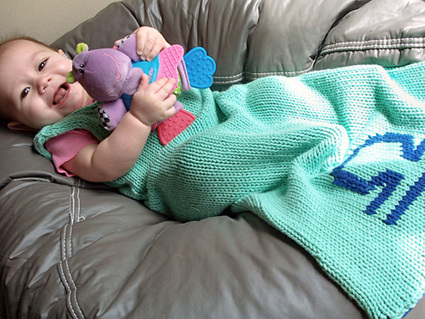 Winter babies are sure to appreciate a nice snuggly zodiac in your favorite wool. Note: If necessary, buy a longer zipper and cut to desired length. Directions for the Three-Needle Bind Off can be found here. Directions for the Cable cast-on can be found here. Directions for Duplicate Stitch can be found here. Using double-point needle, CO 3 sts. Next Row [RS]: K2, sl 1, use tip of leftt needle to pick up a st in edge of work, k this st, pass slipped st over. Slide 3 sts just worked to other end of needle and bring yarn around back of work, ready to begin working the next row. Repeat this row for Applied I-Cord. Using circular needle, CO 80[88, 96, 104, 112, 120] sts. Place marker and join to begin working in the round, being careful not to twist. Round 1: K40[44, 48, 52, 56, 60], place marker, k to end. When working the next round, use waste yarn or split ring markers to mark the work as directed. These markers should be placed in the fabric, between the stitches, rather than on the needle; they are used to indicate the placement of the charted design which will be worked later using duplicate stitch. Next Round: K10[12, 14, 16, 18, 20], place marker in work, k20, place marker in work, k to end. K3[4, 5, 5, 6, 6] rounds. Decrease Round: [K1, ssk, k to 3 sts before marker, k2tog, k1] twice. K 12[13, 14, 14, 15, 15] rounds. Repeat these 13[14, 15, 15, 16, 16] rounds 3[4, 5, 6, 7, 8] times more, then work Decrease Round once more. 60[64, 68, 72, 76, 80] sts. Continue in stockinette st until work measures 14[17.5, 21.5, 25, 29, 32.5] inches. Next Round: BO 3[3, 3, 4, 4, 4] sts, k to 3[3, 3, 4, 4, 4] sts before marker and place 24[26, 28, 28, 30, 32] sts just worked onto st holder; BO 6[6, 6, 8, 8, 8] sts, k to last st, sl 1. 27[29, 31, 32, 34, 36] sts. Next Row [WS]: BO 3[3, 3, 4, 4, 4] sts, slipping first st knitwise instead of knitting it; p to end. 24[26, 28, 28, 30, 32] sts. Repeat these 2 rows 0[0, 1, 1, 1, 1] times more. Work 0[0, 0, 4, 4, 6] rows in stockinette st.
Next Row [RS]: K4[4, 4, 4, 4, 5], k2tog, k1, place 6[6, 6, 6, 6, 7] sts just worked on st holder; BO 8[10, 10, 10, 12, 12] sts, ssk, k4[4, 4, 4, 4, 5]. 6[6, 6, 6, 6, 7] sts. Continue in stockinette st until work measures 2[2.5, 2.5, 3, 3, 3.5] inches from underarm BO. Place these sts on st holder and break yarn. Replace 6[6, 6, 6, 6, 7] held sts of left back shoulder on needle and rejoin yarn. Work as for right back shoulder. Place first 10[11, 12, 12, 13, 14] held sts of front (these will be the sts on your right when RS is facing) on needle with RS facing and join yarn at armhole edge, leaving remaining 14[15, 16, 16, 17, 18] sts on st holder. Row 1 [RS]: K1, ssk, k to end, CO 4 sts using cable cast-on. 14[15, 16, 16, 17, 18] sts. Row 2 [WS]: K4, p to end. Row 3 [RS]: K all sts. Row 3 [RS]: K1, ssk, k to end. -[-, 15, 15, 16, 17] sts. Row 4 [WS]: K4, p to end. Row 5 [RS]: K all sts. Rows 6-11: Work as for Rows 4-5. Row 12 [WS]: BO 7[8, 8, 8, 9, 9] sts, p2tog, p to end. 6[6, 6, 6, 6, 7] sts. Continue in stockinette st until work measures 2[2.5, 2.5, 3, 3, 3.5] inches from underarm BO. Use three-needle bind-off to join to held sts of left back shoulder. Place remaining 14[15, 16, 16, 17, 18] held sts of front on needle with WS facing and join yarn at armhole edge. Row 1 [WS]: P1, p2tog, p to last 4 sts, k4. Row 2 [RS]: K all sts. Row 3 [WS]: P to last 4 sts, k4. Row 3 [WS]: P1, p2tog, p to last 4 sts, k4. -[-, 15, 15, 16, 17] sts. Even-numbered Rows 4-8 [RS]: K all sts. Row 5 [WS]: P to last 4 sts, k2tog, yo, k2. Odd-numbered Rows 7-11 [WS]: P to last 4 sts, k4. Row 10 [RS]: K2, yo, k2tog, k to end. Row 12 [RS]: BO 7[8, 8, 8, 9, 9] sts, ssk, k to end. 6[6, 6, 6, 6, 7] sts. Continue in stockinette st until work measures 2[2.5, 2.5, 3, 3, 3.5] inches from underarm BO. Use three-needle bind-off to join to held sts of right back shoulder. Work 1 row of single crochet around lower edge of piece to provide a firm edge for the zipper. If necessary, use sharp scissors to trim zipper to correct length. Using coordinating sewing thread, sew several overcast stitches through the tape and around last few teeth of zipper on both tracks. This will create a stopper for the zipper pull. Pin zipper in place. Baste zipper tape to front and back lower edges using a contrasting color of thread. Edge of knitted fabric should be close to zipper teeth, without fiber getting caught in zipper. With WS of work facing, backstitch zipper to work along outer edge of zipper tape. With RS of work facing, use an overcast stitch to secure edge of knitted fabric to zipper tape, close to teeth. Beginning at center of underarm, work Applied I-Cord around one armhole edge. When cord is complete, sew live sts to CO end of I-Cord. Work Applied I-Cord around neckline edge, beginning at upper front edge of buttonhole band and ending at upper front edge of button band. BO sts of I-Cord. Sew lower edge of button band to inside of work, beneath buttonhole band. Sew buttons to button band behind buttonholes. Hey, what's your sign, baby? 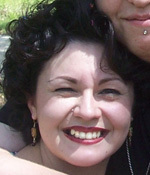 Jacque is a busy mama to two precious little girls who occasionally let her knit. She drives her darling husband nuts with her ongoing yarn accumulation.